Do Protein Shakes Really Help You Get Big? You might have heard from friends and athletes about the benefits of protein shakes for muscle building. Although it’s that true muscles need protein to function and grow, there is no evidence that protein shakes or supplements alone will increase muscle size. Many of the claims about the ability of protein supplements to pump you up are unsubstantiated. Understanding the role of protein in the body will lead to a more accurate picture of how protein shakes affect muscle growth. Protein is found naturally in many foods, such as fish, meat, nuts and soy. It’s an essential part of any healthy diet, and those who are protein-deficient can develop health problems. Health experts recommend 55.5 g of protein daily for men and 45 g of protein per day for women, according to BBC Health. Only small amounts of protein are needed each day, but most people who live in industrialized nations ingest more protein than their bodies actually require. Protein is essential for many body functions, especially those related to cell processes. Whether you consume protein through food or supplementation, it must come from your diet because the body cannot make or store protein. The body needs protein for energy, as well as for tissue growth and repair, according to BBC Health. Protein, carbohydrates and fats are integral factors involved in the metabolic process. The body breaks protein down into amino acids, which are essential for tissue formation. Muscles are built through protein synthesis. Muscle growth naturally begins to diminish in adults after age 20. Consuming particular foods or supplements with protein, such as protein shakes, will not change the size or strength of muscles, according to FAQs.org – World of Sports. It takes exercise and strength training to promote muscle synthesis and muscle development. Sports, such as running, have gradual, long-term effects on muscle development, and weightlifting significantly impacts muscle development more quickly. It’s the process of tearing down and restoring tissue – catabolism and anabolism — that builds muscle. When more synthesized protein is produced than consumed by muscles, they develop, World of Sports says. 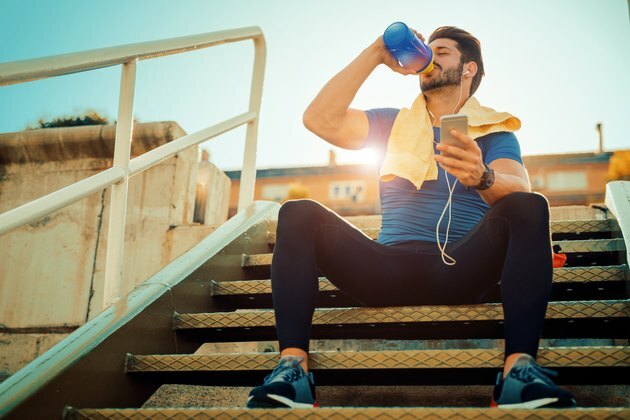 The catabolic process continues in an affected muscle when proteins and carbohydrates are ingested in combination right after exercise – “the process of protein synthesis is immediately stimulated,” states World of Sports. This prevents protein loss in the muscle — but timing is everything when it comes to protein and muscle building. However, muscle synthesis is supported long-term by consistent ingestion of the recommended daily amounts of protein, World of Sports says. Getting enough protein through foods is the healthiest way to maintain adequate levels of the nutrient. However, if you want to supplement your diet with protein shakes, especially while strength training, several kinds of protein supplements are available: soy, whey, egg and casein, according to Bodybuilding.com. Whey protein shakes are considered most beneficial for after a workout because the body absorbs these quickly, according to Bodybuilding.com. After a workout is when your muscles might need extra protein, according to World of Sports. Other protein supplements may only benefit you if you’re not consuming enough protein in your daily diet. Since most people in the Western world get more protein than their bodies require, added protein may not be necessary even during strength training. In fact, too much protein can be harmful, according to a report by CBS news and “The Early Show.” Excessive protein can cause dehydration, kidney problems, digestive problems and osteoporosis, according to CBS. Bodybuilding.com: Muscle Building Guide — Muscle Building Supplements Made Easy! CBS — “The Early Show”: Could Protein Shakes Harm Your Health? Will You Lose Muscle If You Don't Eat Enough Protein & Lift Weights? When to Drink Protein Shakes for Muscles?